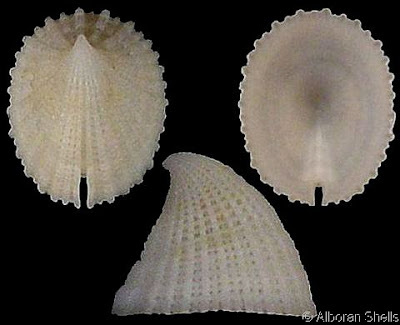 Emarginula fissura, copyright Alboran Shells. The Emarginulini, slit limpets, are a group of limpet-like gastropods with a more-or-less developed longitudinal slit running back from the front of the shell (sometimes only present ventrally). [B59] Baker, B. B. 1959. Publications received: The marine mollusks of Grand Cayman Island, British West Indies. By R. Tucker Abbott. Nautilus 72 (4): 147–148. [NO04] Nakano, T., & T. Ozawa. 2004. Phylogeny and historical biogeography of limpets of the order Patellogastropoda based on mitochondrial DNA sequences. Journal of Molluscan Studies 70: 31–41. [W78] Wells, F. E. 1978. Zonation of marine gastropods on a rocky intertidal shore in the Admiralty Gulf, Western Australia, with emphasis on the genus Nerita. Veliger 20 (3): 279–287.